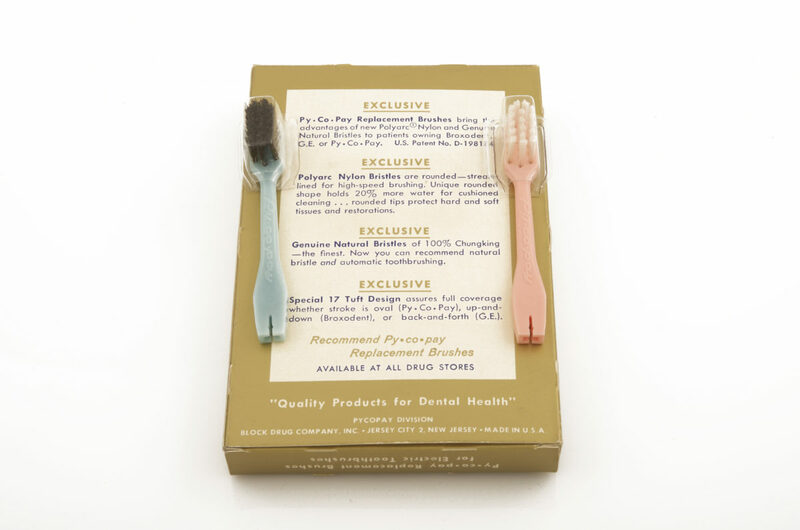 Although early 1960s research results indicated that equivalent performance levels were achievable using either the manual or the automatic toothbrush, consumers were responding mainly to the heavy advertising and promotion surrounding the automatic toothbrush. A vote of confidence was provided to the industry when, in 1964, GE’s and Squibb’s electric toothbrushes were granted recognition by the ADA Council on Dental Therapeutics as “effective cleaning devices.” That year, the electric toothbrush market exploded with somewhere between 40 and 80 companies making the devices, over three million units sold, and annual proceeds of $33 million received from sales. 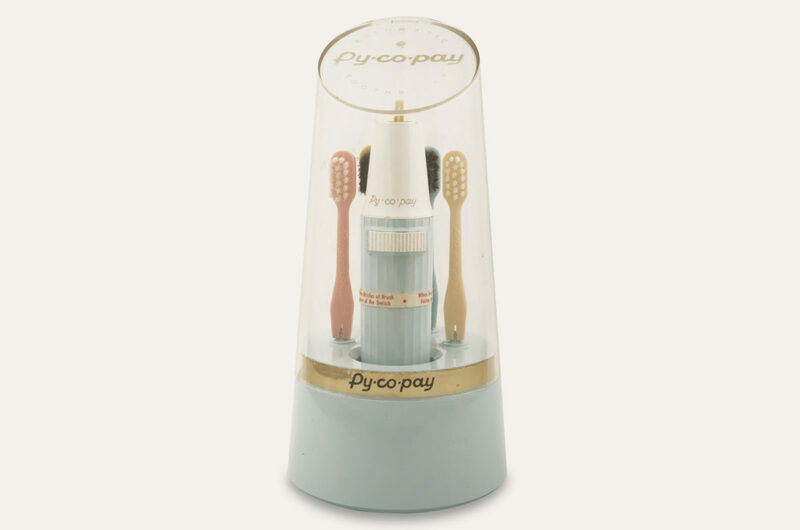 In 1966, the Block Drug Company, maker of the popular Py-co-pay manual toothbrush, entered the automatic toothbrush race. The Py-co-pay Model 1165 Automatic Toothbrush, that delivered an oval stroke, was evaluated by the ADA, placed in a Group B category, and allowed to advertise it “has been provisionally accepted [by the ADA] as an effective cleaning device for use as part of a program for good oral hygiene to supplement the regular professional care required for oral health.” Group A toothbrushes were permitted to leave the word “provisionally” out of their ads. Halberstadt, LJ, et al Universal Toothbrush Head. Patent 3369265. 20 Feb. 1968. 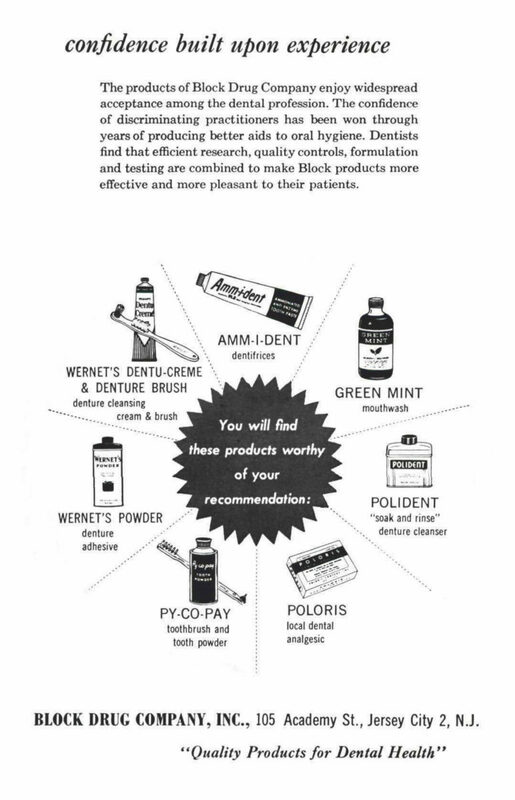 Print; Segrave, K 2010 America Brushes Up, the use of marketing of toothpaste and toothbrushes in the twentieth century. Jefferson, NC: McFarland and Co.
Py-co-pay Model 1165 Automatic toothbrush (A650.2a,b). With the Py-co-pay Model 1165, consumers could choose between using either a Chungking natural brush (left) or a synthetic Nylon brush (right) (A650.2c). L.J. 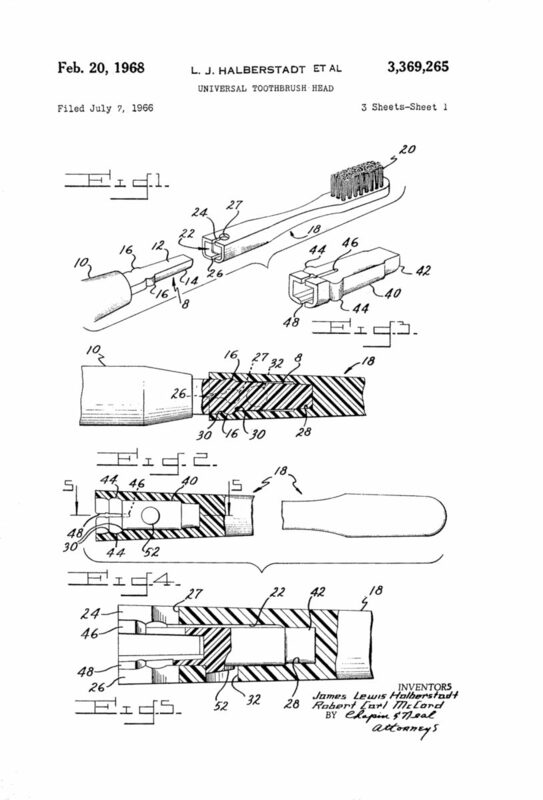 Halberstadt’s 1968 patent for a universal toothbrush head simplified the effort of finding replacements by offering a single brush head with adapters that fit the drive shafts of a variety of popular power toothbrush units, including Py-co-pay’s.